And the future of motorcycles are here......let's go for a ride on a BMW with no riders. The bike doesn't need them. Thanks Harlan for finding this. The BMW ROBO CYCLE is here now. Adventuresome cRc cyclists Philip and Jon are in the final packing stages for a December motorcycle trip to New Zealand. It is summer there. Philip has promised us a write-up of their trip. Both of these guys just tend to "take off" for parts unknown! 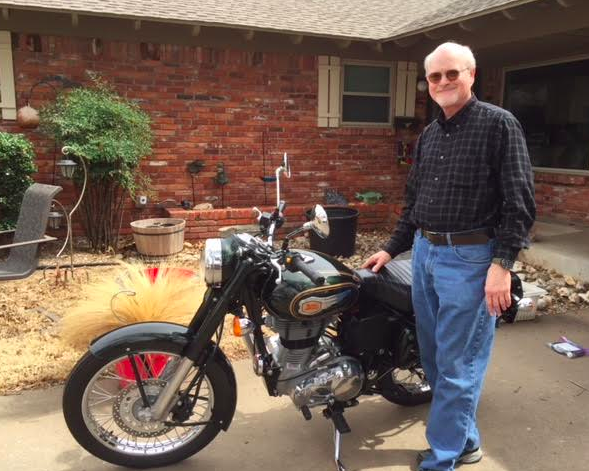 Posted November 3 - Andy Carlson rode his vintage BSA World War II bike to coffee call this morning and the cRc video team was there as everyone gathered around to see this great antique piece of history.......check it out. On November 4th there is a motorcycle swap meet in Guthrie from 9am until 4pm. July 25: 5:00 am on the road from Norman, OK to Lebanon, TN where I overnighted at an “affordable” motel. July 26: Arrive in Anderson, SC early afternoon to drop the Heritage off with Timms Harley-Davidson for new front and rear tires and to meet with some friends - two of which joined me on the journey as far as Rhode Island. Two nights free lodging at Chuck and Jackie’s house with meals included. You can’t beat good friends! July 27: Pick up the Heritage from Timms Harley and take it to Brian’s shop where I can install a new oil filter and oil. Ready to go. July 28: Chuck and I meet Brian at his house to start the journey north. We’re off! We want to make miles today so we stick to the Interstate Highways. We overnight at Creekside Campground in Edinburg, VA.
July 29: We ride the first half of the day on Interstate Highways and then switch to secondary roads and overnight at Bowman Lake State Park near Norwich, NY. July 30: We stop in Lake Placid, NY for lunch on the way to Waterbury, VT to overnight at Little River State Park. We crossed Lake Champlain from New York to Vermont via the Cumberland Ferry. That was an enjoyable and scenic ride, and cheap. July 31: This day took us from Vermont across New Hampshire into Maine for another overnight camp at Naples KOA. The back roads and scenery in upstate New York, Vermont, and New Hampshire were really nice and very popular with the tourists (peak season). It reminded me of the Smokey and Blue Ridge mountains of the Carolinas with a lot more lakes. Beautiful clear water lakes. August 1: We packed our gear and headed for Becky’s Diner in Portland, ME on the waterfront for breakfast. Becky’s is one of those establishments that has been there forever – nothing fancy, but good food at a fair price. If you wonder why up to this point there are no pictures it is because I LOST MY PHONE at Little River State Park in Vermont! We get directions from our server for the local mall, the Maine Mall, where I get a new phone. From there we work our way up the coast of Maine to overnight at Camden Hills State Park very near to – you guessed it - Camden, ME. August 2: After breakfast at some local diner along the road we spent half the day driving and hanging around Acadia National Park on the coast of Maine. Stunning! Did you know that people actually swim in that freezing Atlantic Ocean water and enjoy it? We looked totally out of place in our motorcycle gear with everybody else “dressed” like they were at Myrtle Beach in South Carolina. Continuing up the coast we stopped at Milbridge, ME and camped at some forgotten (by me) campground. Dinner at 44° North in Milbridge. August 3: Breakfast at 44° North in Milbridge. Not much to choose from in Milbridge. We rode up to the West Quoddy Lighthouse which is the easternmost point in the USA… and my first picture! From here we continued up to Rothesay, New Brunswick [N.B.] (Canada) and our first night in a motel. Cha ching! I get some local currency at the ATM across the street. Might as well have been a loan shark, but now I can spend cash if needed. August 4: Saying goodbye to our comfortable motel we drove along the east coast of N.B. which is also the west side of the Bay of Fundy. The Bay of Fundy is famous for the world’s highest tides. As high as 52 feet at the right location with the right conditions. See photo showing low tide. From there we headed to Prince Edward Island [P.E.I.] via the eight-mile Confederation Bridge. That is one long bridge my friend! …and there is no cost to cross the bridge into P.E.I. We found our way to Linkletter Provincial Park on the southern coast of P.E.I. and set up camp. Yep, camping again. August 5: Today was a rain day. This doesn’t mean that we took the day off. It means that we drove in a drizzling rain all day. We drove to the northernmost point in P.E.I. which is known as North Point Lightstation. From there we retraced our steps, but only after breakfast at Shirley’s Café in Tignish, and crossed the Confederation Bridge back into New Brunswick. This time the crossing cost us $18.75 Canadian. Even in the rain it was a nice ride across the bridge. From the bridge we drove to Truro, Nova Scotia and found a Holiday Inn for the night. The rain stopped too. Truro is at the far east end of the Bay of Fundy. The tide change at Truro is only about five feet, but still has the tidal bore which was only a mile from the hotel and scheduled to occur that evening. We got to actually see a tidal bore! See photo. After the tidal bore came past you could actually watch the tide come in. Not like seeing the Space Shuttle launch, but still pretty cool. In Truro this happens on a river so the wave is formed when the opposing currents meet and blah blah blah… On a perfect day the wave can be three feet high in Truro. August 6: We left Truro in the morning a made it to Whycocomagh Provincial Park for another night of camping. But Whycocomagh Provincial Park sits just south of the 180-mile Cabot Trail which is world famous for bikers. So immediately after securing a campsite we headed out for a counter clockwise tour of the Cabot Trail. This way the views are on the right so we don’t have to look across oncoming traffic. At the north end of the Cabot Trail is a side road that leads to Meat Cove, the northernmost point in Nova Scotia. It is 18 miles in and 18 miles out with 8 miles of dirt road each way complete with potholes, but how could we resist visiting a place named Meat Cove? Bragging rights! It is a beautiful place that pictures don’t do justice. Here is a photo anyway. One hundred and eighty miles may not seem that far, but we had started from Truro that morning, and the Cabot Trail is popular for the twisty roads, so we got back to the campground after dark. Not Norman, Oklahoma dark. Nova Scotia dark! Luckily by then I had plenty of practice with my tent and with light from the milky way I was able to get set up and get to bed fairly easily. Yeah, you can actually see the Milky Way in Nova Scotia. The mosquitos diligently urged me to hurry as well. They did that at every campsite. August 7: Break camp and have breakfast at Charlene's Bayside Restaurant and Café. Yep, breakfast with an ocean view. Next stop is Halifax, Nova Scotia via Truro. Yep, Truro again. …not a lot of options for travel in Nova Scotia. Did I mention that this part of the world was having a heat wave? It was in the very high 80’s when we rode into Halifax looking to find a room. No more camping. Yay! But air cooled 1,500cc engines don’t like warm temperatures with no air flow. Luckily, we found ourselves near the Atlantica Hotel and got a room. Supper at Stayner’s Wharf on the boardwalk. Unbeknownst to us, this restaurant sits next to a cul-de-sac where all the local bikers hang out. …and we left our steeds at the hotel. Oh well. The food, drink, live music - all outside on the waterfront - was great. Maybe even awesome. August 8: We had decided a few days ago not to retrace the roads we took into Nova Scotia which meant booking passage on the high-speed CAT that goes from Yarmouth, NS to Portland, ME. We made reservations for the morning of the 9th, so we had to find our way to Yarmouth and get a room. We rode the east coast scenic route until the weather looked like rain and then hauled %#@ to Yarmouth. We got the last room in the local Comfort Inn and had supper at a restaurant on Water Street, a few blocks from where the ferry leaves. August 9: Breakfast at the motel and onto the ferry for a five-hour ride to Portland and lunch at Becky’s. Yes, the same Becky’s where we had breakfast on August 1st. It is a good place. We had to lash the bikes to the deck of the ferry. See photos. From Becky’s we rode to a friend of Brian’s; Mike, that lives in the Providence, RI area. Somebody, not me(! ), thought it would be a good idea to drive through the Boston “Big Dig” Tunnels during 5 o’clock traffic on the way to Providence. Did I already mention the heat wave and how air cooled 1,500cc engines get hot with no airflow?! Brian had to push his bike the last 100 feet out of the tunnel. While sitting just outside the tunnel to let the bikes cool (see photo) my oil temp gage showed 300°F. We made it to Providence, but my check-engine and battery light were on now. Mike had limited beds, but after camping so much and a long day, a spot on the carpeted floor was fine with me. Coffee and pancakes the next morning were exactly what we needed. August 10: After breakfast I got some fresh oil for an oil-only change. I wanted to lose some of the oil that saw 300°F temperatures. While changing the oil in Mike’s driveway, Brian was diagnosing his starter problems which were progressively getting worse on our journey. He ended up replacing the starter, but only after I said my goodbyes and started on the direct journey home. Remember that Brian and Chuck were headed south to South Carolina. While changing my oil I also disconnected and reconnected the battery to clear out the codes, which seemed to work because the check-engine and battery lights were off now. But somewhere in New Jersey at a toll booth I turned off the engine to hear the attendant. It wouldn’t restart. Dead battery and the check-engine and battery lights were back on. My Harley has a dry sump engine with the oil reservoir wrapped around the battery. My logic was that 300°F oil in close proximity to the battery probably cooked the battery. I got a jump start from the attendant and headed on down the road for a while. I stopped at a NAPA Auto Parts store and replaced the battery in New Jersey, Pittstown to be exact. That seemed to remedy the problem and it was getting late so I found a motel for the night in Carlisle, Pennsylvania. August 11: I get up and had a free “breakfast” at the motel and got on the road around 8:00 am EDT. All is well and I am making good time at 75+mph when the check-engine and battery lights come on again. So, I find a Harley-Davidson dealer in Triadelphia, West Virginia. Triadelphia! Who makes up these names?! Anyway, they diagnose the problem as a burned-up stator. Not starter – stator. Apparently, stators don’t do well inside a seriously overheat engine. The photo below compares my toasted stator with a new one. Replacing a stator means tearing into the engine. Luckily, they have a stator and say they have me back on the road in about three hours. So, three hours later, and with a much lighter billfold, I am back on the road and I don’t stop except for gas, coffee, bathrooms, and a couple of catnaps at rest stops until I get home. August 12: I pull into my driveway at 8:30am CDT Sunday morning. Carlisle, PA to Norman, OK is 1,286 miles. Do the math. I zeroed my trip odometer before I left on July 25th. 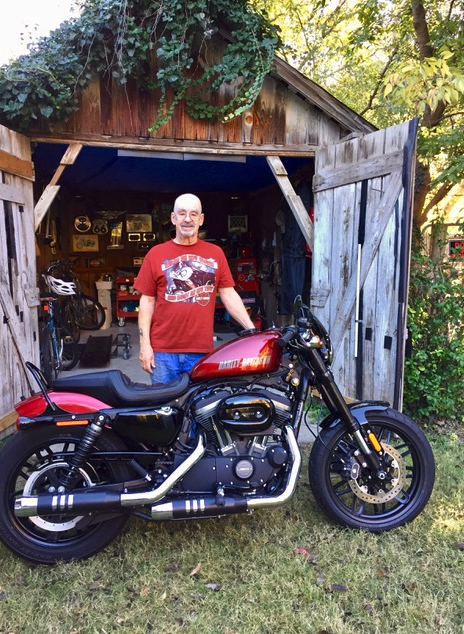 The photo below was taken the morning of August 12th after putting the bike back into my garage. 6,474.7 miles over 18 days. Whew!! Oklahoma, Arkansas, Tennessee, North Carolina, South Carolina, North Carolina, Virginia, Maryland, Pennsylvania, New York, Vermont, New Hampshire, Maine, New Brunswick, Prince Edward Island, Nova Scotia (the real prize), Maine, Massachusetts, Rhode Island, Connecticut, New York, New Jersey, Pennsylvania, West Virginia, Ohio, Indiana, Illinois, Missouri, and Oklahoma. Free to a good home that will respect them - one flag set for your bike. I will have these at the cRc car show so just find me and ask me for them. 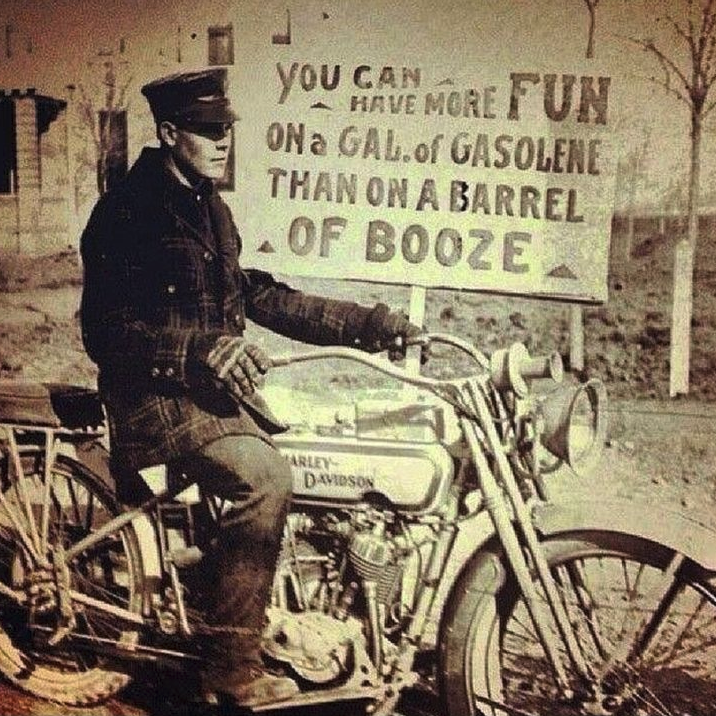 If you don't know me, I drive the bike with the sidecar, or ask Harlan to find me. I recently took a solo backpacking and motorcycle trip to Rocky Mountain National Park near Estes, Colorado. The weather at 12,000+ feet was cool and inviting, the scenery gorgeous. Posted July 16th - Harlan Butler.............this link takes you to an account of a grueling motorcycle race in which the Alta electric motorcycle effectively competes with the gasoline powered bikes. Interesting reading. Posted July 14th - and Ron Borum checks into our potato-potato-potato page with a pasta-pasta-pasta bike of Italian origin. A nicely styled Italian Piaggio - 2008 MP 400 ie The pair of front wheels lean from side to side as you make your turns. Posted July 4th - cRc member JD Whitney recently drove his Honda Ruckus to Mastertech to wish Eddie a happy 90th birthday. This makes at least 2 of these 49 cc bike that we have posted here. The other one is owned by "Ruckus Bob", our remaining World war 2 Veteran. Roy strikes a dapper pose with his new Royal Enfield bike. It certainly is a beauty! From Gary Miller, his 2004 Kawasaki KLR 650. He rode this from North Carolina to the Pacific ocean in Oregon. 22 days 90% off road. 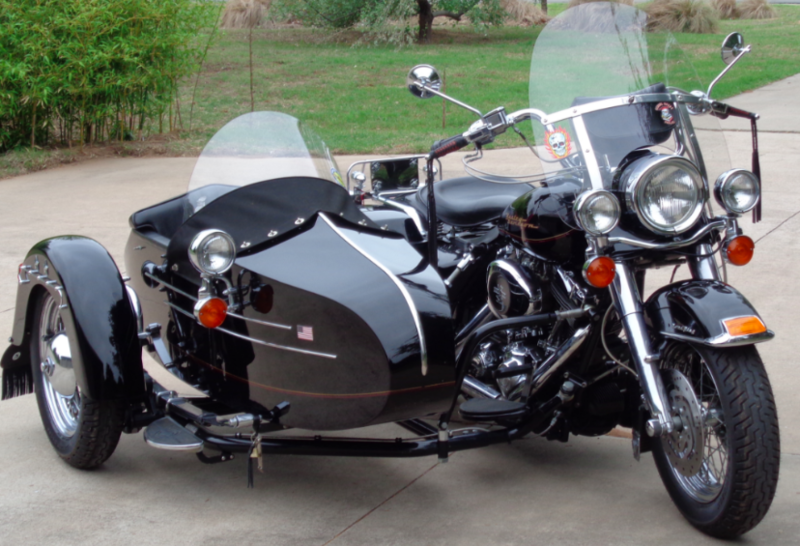 Did you know that in addition to the bike shown below, Gary and Janice have 7 additional bikes in their fleet? My 2001 Honda Goldwing 1800 My grand daughter loves to ride. Gary's 2009 Harley 1200 Custom and his wife's 2009 Suzuki Bergman. Posted June 5, 2018 ROAD TRIP! Jon Forman and Philip Scott took a recent break from the world and rode into New Mexico and down the Santa Fe Trail....and here are their photos. Well done guys, well done. LosAlamos: We got lost and found one of the most interesting stops on the trip. Upon stopping at a cul-du-sac, a homeowner of a cliff-edge house came out to shoo us away until she realized we were two lost nice old geezers. She immediately became friendly and showed us the cliff edge on her property. No rails. Instant death with a couple of wrong steps. Breath taking view because her house was at the end of a ridge. Everybody's dream house. Fat Man replica in the Bradbury Science Museum. Photo of the ceiling in the bar at the St. James Hotel in Cimarron, NM. Notice the bullet holes from the wild west days. Yes they are real! The hotel is on the Santa Fe Trail. Jon and I road our motorcycles on the Santa Fe Trail. Route 66? ehh! Maricha Thompson weighs in with her beautiful 2002 Harley-Davidson Custom Softail Deuce. This bike is 16 years old? Well done.....Maricha, well done. Soft-tail describes a motorcycle frame with an active suspension. The suspension is fastened to the frame via a horizontal axle that allows it to pivot. This type of frame is favored by those riders who prefer a smoother ride. The active suspension is dampened with the use of shock absorbers. Measured weight (tank full/empty)	775/746 lbs. Seat Height, Unladen	30.9 in. Oil Capacity (w/filter)	2.8 qt. Weight, In Running Order	568 lb. 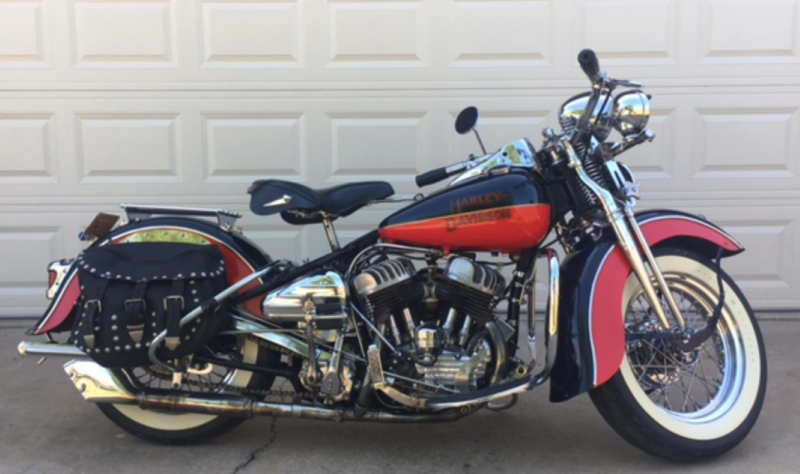 In 1939 the first WLA prototype went from the Harley-Davidson factory to Fort Knox, Kentucky for testing. Harley-Davidson began producing limited numbers of the WLA for the US Army in 1940. Based on the then current WL model, a 45 cu in (738 cc) flat-head, solo-seat v-twin, the suffix “A” means Army. The “W” series had been developed from the “R” series, produced between 1932 and 1936, and “L” signifies high-compression. High compression then meant 5 to 1, of course very low by today’s standards. Did you know? cRc member Bob is one of our last surviving World War Two Veterans? Bob also likes to line dance. Go figure. Did you know? About 6 years ago, cRc member Ron Blisset rode a 1914 Indian that he had rebuilt from North Carolina across the United States in the Motorcycle Cannonball Endurance Run and finished at Santa Monica pier in California. Ask him about it sometime, he will tell you an amazing story about the little red Indian. Roy also owns a new Royal Enfield.